Enhance your advertising with a business profile page or a full website linked to valpak.com. As a Google Premier Partner, Valpak has proven expertise in launching, managing and optimizing online advertising campaigns. You can also choose pay-per-click, social media and search engine optimization services. Track your advertising spend with tools designed to help small and medium-sized businesses succeed. Call tracking gives you insights into telephone responses, while performance tracking monitors the calls that come from both your URL and telephone number. These tools make your ROI clear, accessible and manageable. 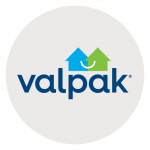 For specific dates and coverage, contact your Valpak of Greater Charleston representative.